The 2018 Worcestershire Festival of Business took place on Friday 14th September at Chateau Impney Hotel in Droitwich Spa. The fifth annual celebration of Worcestershire enterprise and entrepreneurship was the biggest event so far with 95 businesses and charities represented. The day kicked off early with a sell-out networking breakfast with 100 delegates attending a lively Sterling Networks Big Breakfast. Both the ground floor & mezzanine areas of the exhibition were packed with exhibitors and a regular stream of visitors throughout the day. 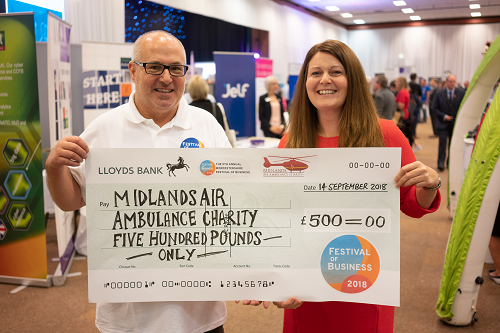 During the event organiser Stuart Allen of Worcestershire Enterprise Ltd handed over a £500 cheque to Michelle McCracken who received the donation on behalf of the Midlands Air Ambulance Charity. The Worcestershire Festival of Business event returns to Chateau Impney in September 2019.